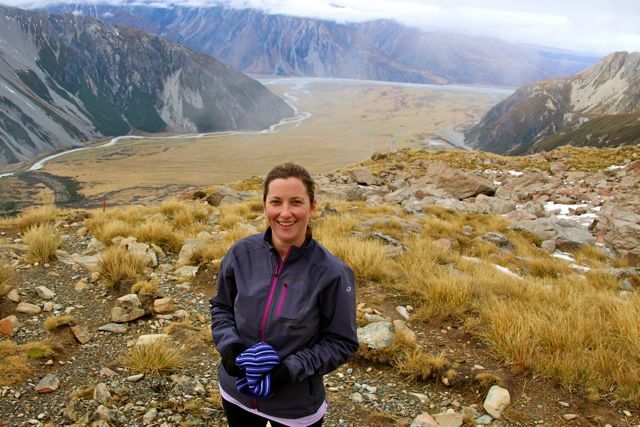 A number of people had recommended the Muller Hut track in Mt Cook. However at this time of year crampons and an ice axe are recommended so it became ruled out for me. However I ventured up the track anyway to see just how far I could get without them! Got a new jacket so thought it was time for a photo in some different clothes! The track starts on the flat before steeply climbing up the mountain. There are alot of steps. Didn’t count them but read somewhere it’s close to 2,000. Had flashbacks to early morning boot camp training, although my pace this day was more gentle. In saying that it was easier to run down rather than walk – I know, I surprised myself with that too. The initial plan was to get just as far as Sealy Tarns, thinking the track after would require crampons. However it wasn’t so bad so I kept going for a while. It was hard not to as the views just kept getting better of both Mt Cook and also the wider valley. That was until the clouds came down and down until I couldn’t see anything. So it made my decision easy not to finish the track and instead leave Mueller Hut for another day when I can see it and have my gear so I can stay there. Imagine I am already starting my list for my next trip and I haven’t even left yet.